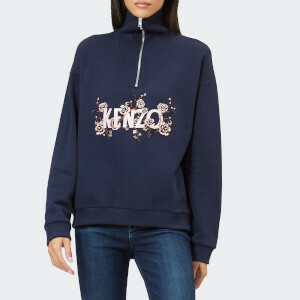 Striking white trainers from KENZO with the brand’s signature floral design. Crafted from smooth white leather, the ‘Tennix’ sneakers are designed with contrasting ‘Cheongsam Flower’ embroidery which takes inspiration from traditional Chinese flowers and a silicone KENZO logo on the vamp. The trainers sit on a semi-flexible white rubber sole with an embossed logo on the heel. Upper: Cow Leather. Sole: Rubber.